When I was in middle school a new church came to my town. It built a huge building on the outskirts of the city. They had rock bands playing for all the services. And they had big video displays with indoor pyrotechnics. And once a year, to attract the teenagers, they had this group of traveling evangelists come in for this sort of modern day tent-revival. They were a group of Christian bodybuilders, and they would do things like tear phone books in half, or break handcuffs in two, all while Christian rock was blaring loudly. And they would then say that they were able to do these things not because they were strong, but because Jesus Christ was giving them the strength to do it. Really, all that church taught me was what I wasn’t looking for in church. And so when I went looking for a church later on, all I really knew was that I wanted to find something as different as possible. So you may be wondering what this has to do with today’s passage. Jesus uses a lot of metaphors to talk about our relationships with God. Here he uses the image of a growing vine and God as the vinegrower. And Jesus talks about how God prunes us. The parts of the vine that are growing well, and bearing good fruit, God allows to flourish. And the parts that no longer produce fruit, God cuts back in order to allow new life to grow. It’s that image of God as a gardener that I really love. I’m only recently learning about gardening, and I’m learning about the importance of good soil and of cultivating what is thriving, and pruning what isn’t anymore. And I’m learning about what goes into making the whole plant grow. I like that image because it’s so organic, and it makes sense to me. You let what naturally works well happen, and you make space for that. And if you do it well, you find that the whole plant grows healthy and strong. I also like that image because I believe it’s true for churches too. And I believe it’s a good metaphor for a process our church is starting to undertake. You may remember that back in January I was gone for about a week to Arizona for my annual continuing education time with the Next Generation Leadership Institute of the UCC.And this year we studied a program called “Natural Church Development”, which is a church growth program. And, frankly, I was skeptical. I’ve heard about a lot of consultants who promise to come in and help your church grow if you only pay them thousands of dollars. It rarely works. But this seemed different. It wasn’t about selling anything. It was just a way of thinking organically about church growth, taught from pastor to pastor. And the success rate was impressive. 80% of churches who undertake and complete this program see a 50% increase in their growth rate. And so after talking with colleagues who had used this same program, I proposed it to the church council back in January, and they agreed that we should try it. In February we had thirty of our church leaders take a survey. The program asks for only thirty people to take it, and so we were strategic about whom we asked, because we wanted a real diversity of people in terms of gender, age, background, and so forth. 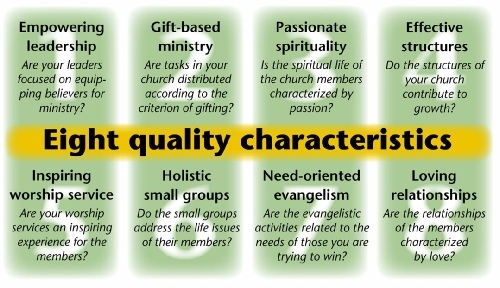 The survey asked questions designed to measure what are called “quality characteristics” of churches. These are traits that they have found growing and healthy churches around the world, from Catholic to Protestant to evangelical to Orthodox all somehow have in common, despite their differences. The eight characteristics are (and don’t worry…you don’t have to memorize these): Inspiring worship, gift-based ministry, empowering leadership, loving relationships, effective structures, need-based evangelism, holistic small groups, and passionate spirituality. The principle of this program is that if you concentrate on those things, if you make sure that the soil you are planted in is good and that the parts of the vine that are growing well can flourish, your church will naturally and organically see growth. So, when the results came back, I went through that process in my head. I agreed with the good stuff. The survey said our maximum factor, our strongest score, was in inspiring worship. We also did well in other areas like gift-based ministry, effective structures, empowering leadership and loving relationships. But then came the other shoe, and what is called our “minimum factor”. That “minimum factor” is very important because that’s the thing in this process your church then turns to and decides to work on. That’s the gardening project, so to speak. And for us, that minimum factor was “passionate spirituality”. Our score was not bad, but everyone does have to have a minimum score in one area, and that was ours. That’s where we have the greatest opportunity as a church to improve, and get even better. But, for me at least, there was an issue with that. I heard “passionate spirituality” and I had some preconceptions of what that looked like. I was right back there in my hometown with the church with the screaming guitars and yelling evangelists and the exuberant prayer meetings. And my first instinct was to run. Because I saw what happened to my friends who went to that church. I saw how their faith was exciting and new for a few years, and then they sort of left it behind. Or, I saw how others used what they learned at that church to bully people who weren’t like them by saying they were concerned for their souls. I saw how sometimes a person’s sincere Christian convictions seemed to be inversely proportional to how loud they were about their faith. And, I don’t know about you, but I didn’t want our church to become like that. There are dozens of churches surrounding us where you can find that. But what there are not are many churches like ours where you can come with your heart, and head, and hands, and connect with God, and with the world in a thoughtful, often more quiet, way. But then I had to go a step further, and I had to really examine what they meant by “passionate spirituality”. And I talked to others, and came to understand that my preconceptions were all wrong. I heard “passionate spirituality” and I automatically assumed it meant becoming something we are not. But what I found was something very different. I found that it was about being who we are, but even better. It turns out that passionate spirituality is not about the way you worship. You can find passionate spirituality in mainline Protestant churches like ours, in Catholic churches with a formal liturgy, and even in quiet Quaker meetings. It’s also not about specific beliefs. You don’t have to subscribe to a set view of the God, and sign on the dotted line. And it’s not about being loud or flashy or being the next big thing. Instead, it’s about this. It’s about being passionate about your spiritual journey, the same way that you are passionate about the other things that matter in your life, and it’s about being rooted in your relationship with the divine, and able to connect that to all that you do. I am passionate about my marriage, for instance. I love my spouse. I am dedicated to my marriage. I work on it, and value it and make it a priority. What you don’t hear me doing, though, is shouting out to everyone who will listen how awesome marriage is and how everyone needs to get married and if you want to do marriage right you need to do it the way that I do. In fact, if I did that, you might wonder if the marriage was really all that strong to begin with. But, even if I’m not shouting about it, it’s important to me. It gives me life. The same is true of my spiritual life. My spiritual connection with God is my guiding force in life. It helps me to make the big decisions that matter. It is always with me. And it is because of my faith that I live the way that I do, and make the choices I do on a daily basis. And it is only when I am being fed spiritually that my faith thrives. Likewise, as a church, it is because of our connection with God that we are able to do amazing things. It is because of our faith that we feed the hungry. It is because of our faith that we care for the planet. It is because of our faith that we work for justice in the world. And it is because of our faith that we come here each Sunday, and we love one another. It is because we are planted in good soil that we are able to do good things in the world. That soil is the soil of our faith. And we make it good soil by connecting with God spiritually. That is what roots us. That is what feeds us and gives us passion for the work we will do. But when we let that soil grow dry, when we stop growing spiritually, when we stop nurturing what grounds us and roots us, we find that we are like a vine that has stopped growing, and one that will no longer bear good fruit. I have known churches like that. Churches that are so busy that they forget why they are there in the first place. Churches that lose their connection with the spiritual, and lose the passion that once drove them. People don’t tend to stay long in those churches because they get so burned out trying to work in dry soil. But I don’t think that’s us. I think we have good soil here. And I think it can be even better, and that as we grow spiritually what we have planted will grow as well. And in the end we will see it, and we will know that it was growing in us all along, just waiting for the soil to be even better. And so, I’m excited about this journey. I hope you are too. And I hope that you will join me on Saturday morning for our retreat. We are about to do some gardening, and we need your hands to help till the soil, and plant the seeds. Amen? Very good and true. Here in Brazil we live in the same situation and only with the help of the Holy Spirit and the determination to remain within what is the will of God, to have intimate communion with Him and manifest His glory and character and this will be fertile ground for fructify the will of God. A big hug. Marcos de Paiva, Pr. MD.